D. Bruce Burlington, M.D., Former Director of the Center for Devices and Radiological Health (CDRH), will join a FDC Reports and Windhover sponsored webinar called The Road to FDA Approval: Advisory Committee Survival Strategies on Tuesday, July 10, 2008. Venture capital investments in stent companies have remained strong over the past three years. According to Windhover's Strategic Transactions Database, VCs invested more than $114 in stent start-ups last year, compared with $31 million in 2006 and $70 million in 2007. Technorati Tags: CardioMind, medical device financing, medical device investment, publicly traded, stent companies, stent start-ups, VC, Venture capital investments, Xtent Inc. The European market for BPH treatment products, including drugs and minimally invasive therapies, was valued at approximately $718.1 million in 2007. Sales of BPH treatment products in Europe are expected to increase at a compound annual rate of 4.5%, reaching an estimated $857.0 million in the year 2011. Find out about the most promising drug therapies and minimally invasive energy-based treatments on the horizon. 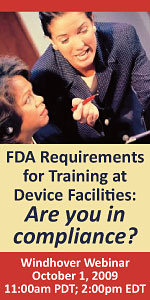 Device companies are not the only ones tripped up by the new ClinicalTrials.gov trial registration requirements, as FDA, NIH and others struggle to define what is and is not subject to the law. Find out why device companies operating in Europe should develop internal plans to avoid "dawn raids" by the European Commission or a national competition authority aimed at investigating potential anti-competitive practices. Find out why endocrinologists are cautioning CMS against making any immediate policy changes on how Medicare covers bariatric surgery to treat diabetes. Start your 30-day, risk-free trial of PharmAsia News today! Lost in the news that Boston Scientific is continuing to sell off pieces of itself was the creation of a new venture capital fund affiliated with secondary buyer Saints Capital. Saints raised $165 million for new fund, Saints Everest. It paid $100 million for 54 companies from Boston Scientific's venture portfolio. Its investors include Adams Capital Management and Harbourvest Partners LLC, according to Scott Halsted, the firms' new managing director. As device makers ready themselves for stricter oversight of their relationships with doctors, the Medical Device Manufacturers Association has signed a partnership with a compliance consulting firm that will give MDMA members special access and discounts on compliance software tools and services.